After walking around with my Gucci Marmont bag for almost 6 months, I think it’s safe to say, it might be my favourite bag of all-time? I’m obviously obsessed with the colour, it goes beautifully with every single piece in my wardrobe, but my love goes way beyond just the colour. I hummed and hawed over the size, for what seemed like forever, but finally decided on the small. It fits all my daily essentials perfectly, without being too oversized or heavy. I have no problem fitting my iPhone 8 Plus, sunnies, regular size wallet, a mini agenda, keys, hand cream, lipstick, etc. without it being too full or stuffed. The versatility of this bag is where it really shines. It has a slightly softer structure than other bags, but its almost “squishy” material allows you to get in and out of the bag with ease. Simply push together the clasp to get in and then lift the flap. The spring closure ensures your bag stays closed when not in use. The long and durable strap not only allows it to be worn on your shoulder but can quickly convert into a crossbody style to leave your hands free. It’s comfortable to wear all day. As for wear and tear, it’s only been 6 months, but it’s still in excellent condition (and I wear it all the time). Although the leather may feel soft, luxe and oh-so delicate, it’s holding up nicely. You wouldn’t want to get caught in the rain or spill something on it, but I haven’t seen any colour transfer yet. I’ve worn extremely dark clothing, even dark-wash denim, and nothing has worn off on it. The stunning antique gold toned hardware hasn’t scratched or become dirty or worn. The bag still looks in mint condition even after a ton of use and travel. 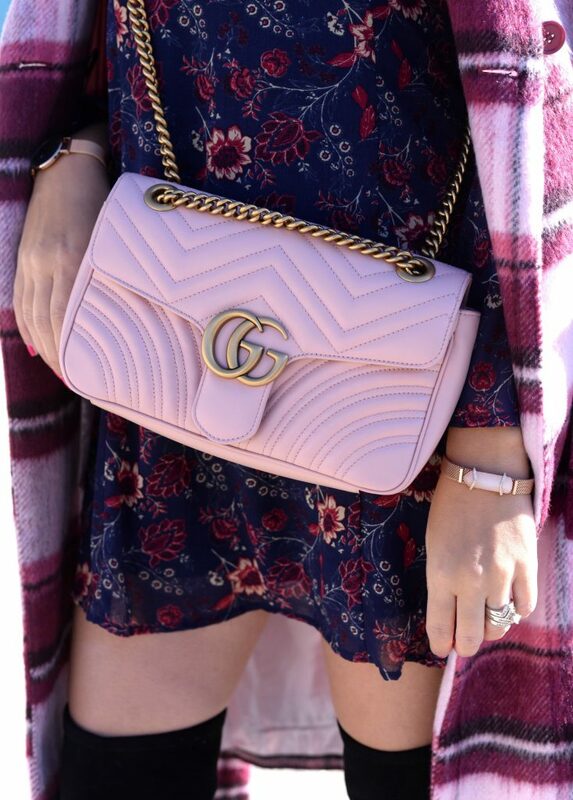 A designer bag is all about the detail, and the Gucci Marmont is no exception. The heart detail on the back of the bag is adorable, the gorgeous grey microfiber grey lining is luxe, and the hidden inside zipper is perfect for hiding small valuables.